Northern California Camp Fire Contained It was the deadliest and most destructive in the state's history. 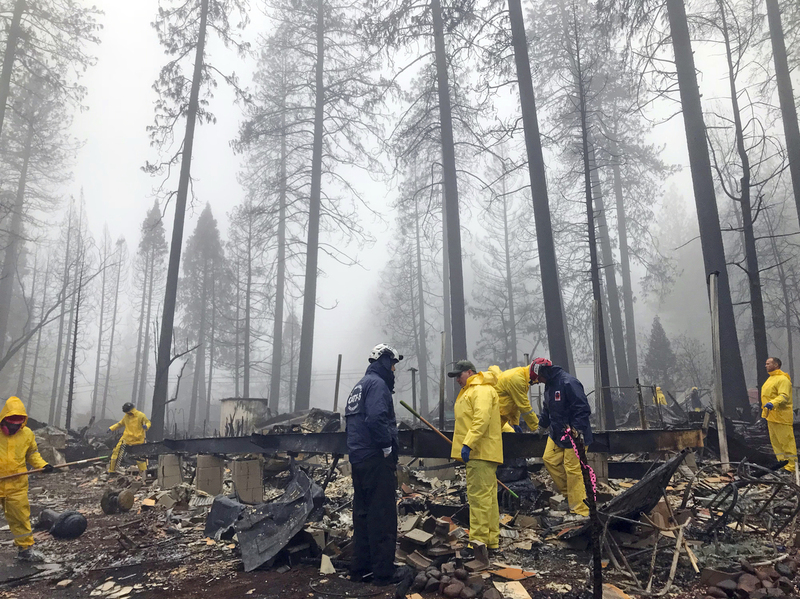 On Sunday, crews continued to search for remains from the blaze, which began more two weeks ago, and has killed at least 85 people. Volunteers search for remains at a mobile home park in Paradise, Calif., on Friday, Nov. 23. The Camp Fire destroyed the town. After more than two weeks, the Camp Fire of Northern California is 100 percent contained. It was both the deadliest and most destructive fire in California's history. The Camp Fire has killed at least 85 people since it started on Thursday, Nov. 8. As of Sunday, 271 people remained unaccounted for, according to the Butte County Sheriff's Office. Names are gradually coming off that list, as relatives and loved ones contact each other — but many likely won't come off. Search and rescue teams continue their efforts. "It's like being in a war zone," Chuck Williams, who handles dogs searching for remains in the town of Paradise, Calif., told NPR's Bobby Allyn. "We need to ensure we have evacuation routes and that we have other infrastructure that's hardened that can ... be resilient or at least resist this intensity of fires," California Fire Chief Ken Pimlott told NPR's Scott Simon on Weekend Edition.